A SpaceX Falcon 9 rocket carrying NASA's GRACE Follow-On Earth-observation satellites and five Iridium Next communications satellites stands atop Space Launch Complex 4E at Vandenberg Air Force Base in California on May 21, 2018. Liftoff is scheduled for May 22. SpaceX will launch two new Earth-observing satellites for NASA and five commercial communications satellites today (May 22) in a ride-share mission that you can watch live online. 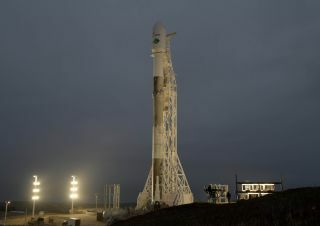 NASA's Gravity Recovery and Climate Experiment Follow-On (GRACE-FO) mission and five Iridium Next communications satellites will lift off on a used Falcon 9 rocket from Vandenberg Air Force Base in California at 3:47 p.m. EDT (12:47 p.m. PDT, 1947 GMT). You can watch the launch live here at Space.com and on our homepage starting at 3:15 p.m. EDT (12:15 p.m. PDT, 1915 GMT), courtesy of a NASA TV webcast. The Iridium Next communications satellites that SpaceX is launching with GRACE-FO are the latest in a series for Iridium Communications to build up that company's satellite constellation. The five Iridium Next satellites will join 50 other satellites already in orbit from five previous SpaceX launches (each of which launched 10 satellites). When complete, the Iridium Next constellation will include 75 satellites — 66 operational satellites and nine spares. NASA's twin GRACE Follow-On spacecraft (top) and five Iridium Next communications satellites are stacked like a cake before being loaded onto a SpaceX Falcon 9 rocket for a May 22, 2018, launch into orbit from California's Vandenberg Air Force Base. GRACE-FO, a joint project between NASA and the GFZ German Research Center for Geosciences, will use twin satellites the size of small cars to map changes in Earth's water and ice, such as rising sea levels and melting of the polar ice caps. Unlike most Earth-observation satellites, GRACE-FO won't "use imagers [to] collect light reflected from the surface or the atmosphere," said David Jarrett, GRACE-FO program executive, said at a news conference Monday (May 21). Rather, "the instrument is really the two satellites together as a system" to detect changes in Earth's gravity, he said. The two identical spacecraft will fly in unison, with one trailing the other at a distance of 137 miles (220 kilometers). When they pass over a part of the Earth where the strength of the gravity field either increases or decreases, it will affect the distance between the two spacecraft ever so slightly. So, to obtain information about the distribution of mass below, the GRACE-FO satellites need not look down; instead, they'll only "look" at each other and measure their separation by constantly sending microwave signals back and forth. "If mass changes on the ground — like in aquifers, or melting glaciers, or in the oceans and so on — you see it immediately in a change which we measure very, very precisely by a microwave tracking system with a precision of about 1 micrometer. That is about one-tenth of a human hair over the distance between Los Angeles and San Diego," Frank Flechtner, GRACE-FO's project manager at GFZ in Potsdam, Germany, said at the news conference. GRACE-FO will spend the next five years mapping Earth's gravity to study the effects of climate change around the world. Visit Space.com today for complete coverage of SpaceX's Falcon 9 launch for NASA's GRACE-FO and Iridium's satellite constellation.